gorgeous wrote: Fact check: Dozens of Democrats, including Senate Minority Leader Schumer did vote for the Secure Fence Act of 2006, which authorized building a fence along about 700 miles of the border between the US and Mexico. "B отговор до @NBCNews" is a Russian Trump propagandist you complete idiot. Indeed, the Russian title means "In rebuttal to...". Toronto Star wrote: When he arrived in McAllen, Texas for an immigration roundtable at a Border Patrol station, Trump derided critics who dismiss walls as outdated and ineffective. He said some old technology, such as the wheel, is timeless. “A wheel is older than a wall,” he said. He repeated it a few seconds later: “The wheel is older than the wall. Absolutely. What else would he have read to give him the crazy idea that he knows something a 7-year-old doesn't know? Maybe some hope for the Democrats in 2020. I don't know Sherrod Brown, but if he got elected from Ohio, he can't be a flaky coastal radical. Let's hope there are no skeletons in his closet. PRESIDENT DONALD TRUMP has claimed that gangs transporting illegal migrants across the US-Mexico border have “ have bigger, stronger, and faster vehicles than police”. I wonder where he's getting that idea from? I just hope he never sees The Dark Knight Rises or he might want to place a travel ban on Santa Prisca. Naw, this is probably personal observation. I'm sure we've all seen those migrant caravans of two-seater sports cars streaming across the border so fast the Border Patrol can't stop them. I assume he is garbling up speed boats delivering drugs around Maro Lago with cars in general. Confusion is easy....overdosing on cheetos at 3AM. Yep, them. Now you know why GM is closing down American and Canadian plants and moving them to Mexico. When the dems finally get the government being paid for working, it would be good if they could back-pay the workers who were affected. They absolutely will, and the Republicans will gladly go along with it. Everybody agrees about that. Even Trump is engaging in illegal shenanigans to keep paychecks coming to employees of the IRS. That's so that his wealthy friends don't have to wait for their newly installed government handouts. And now that the TSA screeners and air traffic controllers are getting restless, suddenly we hear they'll all get a $500 bonus when the shutdown ends. Who promised that? It seems to me that would have to be voted by the House, or else it would have to come from somewhere within the Homeland Security Agency budget. So, where will they get the....? Hmmm, here's an idea: The funds for the Wall won't be used for many years, so perhaps they could be "re-directed"? Give 'em even more. Seems many are not only serving, but serving cheerfully - as the mature and responsible examples certain otheRs are not. I think the GOP is flinching. Yesterday, Lindsay Graham was urging Trump to declare the emergency and build the wall. Now, staring into the abyss, he suggests that Trump FIRST open the government and give the Democrats three weeks to capitulate before declaring the emergency. So, we may not get the declaration of emergency after all. Surely enough Republicans can see the damage they're taking to know that they are neck deep in the Big Muddy and had better not move forward. What they'll try to do is get Trump to announce that he's going to be tough but recognizes that people are suffering from the shutdown, then gradually let other news come in and crowd out the fact that he's not, after all, going to press for that wall. He's taking serious hits with midwestern farmers right now. You know, those self-reliant despisers of the freeloaders in the big cities, who would never ask government for anything, except the subsidies they are entitled to. Putin haz no motivation to cave. He iz racking up points faster than ever now, so will direct Trump to keep the shut down going. Chuck and Nancy are seeing the anger rizing agenst the GoP, so will be happy to let it go on. It will go on till the GoPs finally figure out they are the biggest loozrz. And beyond. As this shutdown and the Wall get LESS popular with everyone else, they get MORE popular among Republican voters, so Mitch McConnell and his cohorts won't dare oppose them. The only solution will be to recall every goddamned one of them. This will NOT go much past the state of the union message. There will be massive resignations among TSA people, air-traffic controllers, and others vital to the economy. We're closer than might appear to actual chaos and economic breakdown. Trump will undoubtedly try to use his State of the Union address to lobby and harangue Democrats. Of course, they get to respond afterward, and they'll be ready, that's for sure. Just make sure that Schumer delivers the response, not Pelosi. She continues to blather on about the moral aspects of the shutdown and its effects on those who want to immigrate. She's absolutely tone deaf about what appeals to people outside the Bay Area. Note added: Trump MAY use the SOTU address to announce dramatically that he is declaring an emergency or (more likely now that he's been shown what a disaster that would be for him) to announce that he will allow the government to re-open with a fixed date for Democrats to cave and give him the money he wants. There will be massive resignations among TSA people, air-traffic controllers, and others vital to the economy. This is just an aside, fwiw. My old friend, Phil Orban, from Bloomfield, NJ, who dated my sister for awhile, was a pilot with American Airlines for several decades. He was never a libertarian or politically active in any sense of the word. He once told me long ago that the air traffic controllers caused more problems than they solved, that the planes had something called transponders, and that the pilots could do a better job without the controllers. Haven't spoken to Phil in several years, and don't know how he would feel now, but maybe Bobbo, as a pilot, and perhaps others, might have a comment on this. What emergency? The mummified one? Well, thanks TP. No....I don't see how. I flew all over the world with many "first time ever" landings at new airports. Yes...pilots can fly the airplane and land them.....but I don't see how we could "order" the landings at any even slightly busy airport. I can imagine some kind of automated system/program assigning slots by some algorhythm but it falls prey to a common recognition: "Flight is not inherently dangerous, just very unforgiving." and another one: "Anyone can fly an airplane......as long as everything goes right." Two axioms I agree with. I don't see how aircraft with low fuel and other less than all out emergencies could be dealt with by pilots in the air.....maybe AI can handle that. Its almost all automated now. I've always wondered just how much "control" is exercised by our control system BEFORE we even take off? I mean "something" must stop every freaking airline to schedule their flights into Kennedy at 8AM? I know there are "gates" and "slots" that airlines bargain over because of landing TIME/scheduling issues.....just don't know if it could be detailed enough to replace the Tower. 've always wondered just how much "control" is exercised by our control system BEFORE we even take off? I mean "something" must stop every freaking airline to schedule their flights into Kennedy at 8AM? I know there are "gates" and "slots" that airlines bargain over because of landing TIME/scheduling issues.....just don't know if it could be detailed enough to replace the Tower. I wonder if other airport personnel sitting at computers do all that, and the air traffic controllers do something else that might be accomplished with transponders)? Maybe someone else can chime in. I'm not interested enough to search for and study the issue. Basically airports have a certain number of gates, which dictates how many planes can be on the ground at any given time. Each airplane landing and taking off also takes a certain amount of time on the runway, plus the amount of time after they pass through that the air is too turbulent for another plane to pass through safely/comfortably. Airlines lease a certain number of gates at airports, and those pretty much correspond to their allowed time on the runways. Flight times are staggered in such a way that there is an opening for landing at one airport the appropriate amount of time (the length of the flight) after a plane departs from another airport. That schedule is up to the airports and airlines. Air traffic control makes sure that planes in flight are not on intersecting paths in 3D space, and that when they come in for landing and takeoff that enough time has passed since the last plane to not have turbulence problems. The bigger the plane, the longer the time until the next plane can follow. But remember, "I'm the only one who can protect you." I've always wondered just how much "control" is exercised by our control system BEFORE we even take off? Air traffic control makes sure that planes in flight are not on intersecting paths in 3D space, and that when they come in for landing and takeoff that enough time has passed since the last plane to not have turbulence problems. 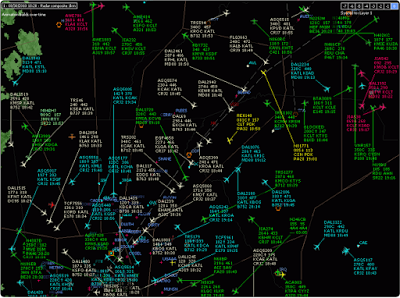 Can pilots handle this with transponders without the help of air traffic control? Maybe in the future as flight controls and air traffic control consoles get simpler, but for now it's way too much for them to handle themselves during flight. And, in his reply to Fox News on this question, he very pointedly tried to intimidate Michael Cohen, threatening Cohen's father with hints of criminal activity, while denying that he knew anything about such activity. (Don't try to figure out how that can be; your head will explode.) He sounded exactly like a Mafioso saying what a shame it would be if anything happened to your brother's dry-cleaning business. And, while we're figuring out how Trump can finger Michael Cohen's father as a criminal while simultaneously denying that he knows anything about any criminal activity, can someone also explain how he can threaten to ruin a NATO ally (Turkey) economically? Isn't it the motto of NATO that an attack against one is an attack against all? So, should the rest of the signatories to NATO now take up arms in defense of Turkey? Air traffic control makes sure that planes in flight are not on intersecting paths in 3D space, and that when they come in for landing and takeoff that enough time has passed since the last plane to not have turbulence problems. The bigger the plane, the longer the time until the next plane can follow. I took the test to be an air traffic controller in my late 20s. The short answer is: No. There are situations where pilots have more information and ability to prevent a collision, but there are other situations where an air traffic control system is the only way to prevent collisions. Letting pilots do it themselves would be like herding cats. An individual can prevent a collision with everything else as long as everything else remains unchanging. But if everything else is also being piloted by an individual who is trying to avoid collisions with every other thing, then suddenly you've got chaos. One pilot's jockeying for position will cause other pilots to compensate, which will cause everyone to need to react to all the changes. In an uncrowded airspace, that might be easy enough, but in modern crowded airspaces even air traffic controllers are being overwhelmed -- they need specialised computers to keep everything in order. Gord wrote: I took the test to be an air traffic controller in my late 20s. One of the greatest TV series is "Mayday" ( "Air Crash Investigations" in UK/Aust & "Air Emergency" in USA) . It is produced and filmed in Canada. Why bother studying to be an air traffic controller, when you can act as an air traffic controller in the TV series. Narrator : "Charter Flight 294 from Sydney to Toronto, taking skeptics to the first Toronto Skeptics convention"
Narrator : "it was a normal flight in clear weather, but no one expected that ............"
Narrator : ....in ten minutes they would all be dead!!!!!!!!!. Narrator : ....oh wait, we must let him finish this scan for the sake of humanity!!!!!!!!!. yes.......they do. I refer to all such folks as "the Tower." Often, not always and not necessarily, the Tower looking out on the airfield is the top floor of what houses the rest of the airport flying operations: ground control, approach control, departure control, enroute and so forth. Pilots are trained how to fly into "uncontrolled airports" meaning there is no Tower operation. What you do is "keep your eyes out of the cockpit" and look for conflicting traffic coming into or taking off at THE SAME AIRPORT. Very uncomfortable situation.....I don't like it. While scanning, you announce your position and intent and ask if anyone else is there. I recall during pilot training there were some local uncontrolled airports that we would use for touch and go practice. Even with only 2-3-4 student pilots with instructors on board planning to use said uncontrolled airport, we would send a pilot there to land and park his aircraft and go into a shed with a radio to act as Tower. Gates and Slots are fine for the Airlines...........but at the same time........you have any other (Private) pilot or military pilot who can decide to go land at O'Hare at 8AM. When too many planes arrive at the same time, scheduled/gated/slotted or free range, its the Job of ATC (air traffic control where ever they are) to select whoever has enough fuel to stay at altitude and fly in a big circle "waiting" for space to open up to allow them to land. I mention OHare because I flew there once and got right in but one pilot was getting snippy having to fly circles for 30 minutes and was told to keep it up. I wonder what "games" the controllers are playing.....should be first come first serve as much as possible?....or, why disrupt lots of traffic just to fit one stable guy flying in circles "into the pattern." Anyway...............yes...............what 1-2-3 pilots can do fairly easy.......gets logarithmically harder when its 50 or 60.........and thats with no emergencies......or some private pilot in a Cessna making his first solo cross country. I'm recalling a time when certain airports carried a NOTAM (Notice to Airmen) to arrive with an extra 30 minutes of fuel for possible additional holding time. In essence: don't come here unless you have to......and then....try to arrive outside our heavy use times. I'd think this situation would only be getting worse what with increased air traffic and fewer airports being used .....aka going from direct routes of yore to the hub and spoke system of today. I like spokes........don't like hubs. Thanks for the information. I assumed they must have solved the problem before putting the thing into commercial use. But I never heard how they solved it. Nice illustration of the Butterfly Effect, Gord! HL Mencken once gave a similar example (I think it was him, but not quite sure now that I reflect. Anyway...) of a beauty contest in which each judge was instructed to try to guess what the average rating of a contestant by the other judges would be, knowing of course that the others would simultaneously be trying to guess what he would write down, and therefore have to take account of the fact that their guesses would be part of the data for the computation they were trying to make in their heads....and so on. He said that's what speculating in the stock market amounts to. I took that message to heart, and I never invest in the stock market.